The Incas of Cusco (Cuzco) originally represented one of these small and relatively minor ethnic groups, the Quechuas. Gradually, as early as the thirteenth century, they began to expand and incorporate their neighbors. Inca expansion was slow until about the middle of the fifteenth century, when the pace of conquest began to accelerate, particularly under the rule of the great emperor Pachacuti Inca Yupanqui (1438-71). Historian John Hemming describes Pachacuti as "one of those protean figures, like Alexander or Napoleon, who combine a mania for conquest with the ability to impose his will on every facet of government." Under his rule and that of his son, Topa Inca Yupanqui (1471-93), the Incas came to control upwards of a third of South America, with a population of 9 to 16 million inhabitants under their rule. Pachacuti also promulgated a comprehensive code of laws to govern his far-flung empire, called Tawantinsuyu, while consolidating his absolute temporal and spiritual authority as the God of the Sun who ruled from a magnificently rebuilt Cusco. Although displaying distinctly hierarchical and despotic features, Incan rule also exhibited an unusual measure of flexibility and paternalism. The basic local unit of society was the ayllu, which formed an endogamous nucleus of kinship groups who possessed collectively a specific, although often disconnected, territory. In the ayllu, grazing land was held in common (private property did not exist), whereas arable land was parceled out to families in proportion to their size. Since self-sufficiency was the ideal of Andean society, family units claimed parcels of land in different ecological niches in the rugged Andean terrain. In this way, they achieved what anthropologists have called "vertical complementarity," that is, the ability to produce a wide variety of crops--such as maize, potatoes, and quinoa (a protein-rich grain)--at different altitudes for household consumption. The principle of complementarity also applied to Andean social relations, as each family head had the right to ask relations, allies, or neighbors for help in cultivating his plot. In return, he was obligated to offer them food and chicha (a fermented corn alcoholic beverage), and to help them on their own plots when asked. Mutual aid formed the ideological and material bedrock of all Andean social and productive relations. This system of reciprocal exchange existed at every level of Andean social organization: members of the ayllus, curacas (local lords) with their subordinate ayllus, and the Inca himself with all his subjects. Ayllus often formed parts of larger dual organizations with upper and lower divisions called moieties, and then still larger units, until they comprised the entire ethnic group. 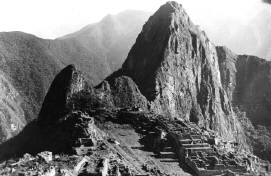 As it expanded, the Inca state became, historian Nathan Wachtel writes, "the pinnacle of this immense structure of interlocking units. It imposed a political and military apparatus on all of these ethnic groups, while continuing to rely on the hierarchy of curacas, who declared their loyalty to the Inca and ruled in his name." In this sense, the Incas established a system of indirect rule that enabled the incorporated ethnic groups to maintain their distinctiveness and self-awareness within a larger imperial system. All Inca people collectively worked the lands of the Inca, who served as representative of the God of the Sun--the central god and religion of the empire. In return, they received food, as well as chicha and coca leaves (which were chewed and used for religious rites and for medicinal purposes); or they made cloth and clothing for tribute, using the Inca flocks; or they regularly performed mita, or service for public works, such as roads and buildings, or for military purposes that enabled the development of the state. The Inca people also maintained the royal family and bureaucracy, centered in Cusco. In return for these services, the Inca allocated land and redistributed part of the tribute received--such as food, cloth, and clothes--to the communities, often in the form of welfare. Tribute was stored in centrally located warehouses to be dispensed during periods of shortages caused by famine, war, or natural disaster. In the absence of a market economy, Inca redistribution of tribute served as the primary means of exchange. The principles of reciprocity and redistribution, then, formed the organizing ideas that governed all relations in the Inca empire from community to state. One of the more remarkable elements of the Inca empire was the mitmaq system. Before the Incas, these were colonies of settlers sent out from the ayllus to climatically different Andean terrains to cultivate crops that would vary and enrich the community diet. Anthropologist John V. Murra dubbed these unique Andean island colonies "vertical archipelagos," which the Incas adapted and applied on a large scale to carve out vast new areas of cultivation. The Incas also expanded the original Andean concept of mitmaq as a vehicle for developing complementary sources of food to craft specialization and military expansion. In the latter instance, Inca mitmaq were used to establish permanent garrisons to maintain control and order on the expanding Inca frontier. What "began as a means of complementing productive access to a variety of ecological tiers had become," in the words of Murra, "an onerous means of political control" under the Incas. By the late fifteenth century and early sixteenth century, the Inca Empire had reached its maximum size. Such powerful states as the coastal Chimú Kingdom were defeated and incorporated into the empire, although the Chimús spoke a language, Yunga, that was entirely distinct from the Incas' Quechua. But as the limits of the central Andean culture area were reached in present-day Chile and Argentina, as well as in the Amazon forests, the Incas encountered serious resistance, and those territories were never thoroughly subjugated. At the outset, the Incas shared with most of their ethnic neighbors the same basic technology: weaving, pottery, metallurgy, architecture, construction engineering, and irrigation agriculture. During their period of dominance, little was added to this inventory of skills, other than the size of the population they ruled and the degree and efficiency of control they attained. The latter, however, constituted a rather remarkable accomplishment, particularly because it was achieved without benefit of either the wheel or a formal system of writing. Instead of writing, the Incas used the intricate and highly accurate khipu (knot-tying) system of recordkeeping . Imperial achievements were the more extraordinary considering the relative brevity of the period during which the empire was built (perhaps four generations) and the formidable geographic obstacles of the Andean landscape. Viewed from the present-day perspective of Peruvian underdevelopment, one cannot help but admire a system that managed to bring under cultivation four times the amount of arable land as today. Achievements such as these caused some twentieth-century Peruvian scholars of the indigenous peoples, known as indigenistas (Indigenists), such as Hildebrando Castro Pozo and Luis Eduardo Valcárcel, to idealize the Inca past and to overlook the hierarchical nature and totalitarian mechanisms of social and political control erected during their Incan heyday. To other intellectuals, however, from José Carlos Mariátegui to Luis Guillermo Lumbreras, the path to development has continued to call for some sort of return to the country's pre-Columbian past of communal values, autochthonous technology, and genius for production and organization. By the time that the Spaniards arrived in 1532, the empire extended some 1,860 kilometers along the Andean spine--north to southern Colombia and south to northern Chile, between the Pacific Ocean in the west and the Amazonian rain forest in the east. Some five years before the Spanish invasion, this vast empire was rocked by a civil war that, combined with diseases imported by the Spaniards, would ultimately weaken its ability to confront the European invaders. The premature death by measles of the reigning Sapa Inca, Huayna Cápac (1493-1524), opened the way for a dynastic struggle between the emperor's two sons, Huáscar (from Cusco) and the illegitimate Atahualpa (from Quito), who each had inherited half the empire. After a five-year civil war (1528-32), Atahualpa (1532-33) emerged victorious and is said to have tortured and put to death more than 300 members of Huáscar's family. This divisive and debilitating internecine conflict left the Incas particularly vulnerable just as Francisco Pizarro and his small force of adventurers came marching up into the Sierra.